This weekend my son Kevin and I went on a road trip north to do prototype research on the Donner Pass route of the Southern Pacific. This was part of the original transcontinental railroad surveyed by Theodore Judah and finished by the Central Pacific Railroad in 1869. The CP became part of the Southern Pacific and then in 1996 the SP merged into the Union Pacific which operates the Donner Pass route today. Track #1 required building four tunnels blasted with black powder through the granite a few feet at a time. A second track was added to Donner Pass by the SP in 1925 and included the building of 10,322 foot long Tunnel 41 on track #2 that passed under Donner Mountain and made an easier route over the summit. Track #1 was abandoned in 1993 and now all trains going over the summit in both directions use Tunnel 41. The UP also owns the Feather River route which offers easier grades over the Sierras and today the Donner Pass route sees less traffic than in its heyday under the SP. 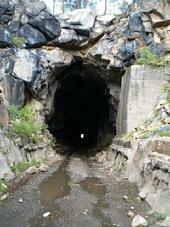 The original tunnels and roadbed are still there and are used by dirt bikes and hikers for recreation. Quite a number of people visit the area to look at the historic transcontinental route. I drove up to the summit Saturday afternoon to take some pictures. In particular I was interested in making a panorama of the summit tunnels. On my next layout I intend to build a layout design element of this area. I took seven individual shots panning from west to east and a couple of closeups. I stitched all of these together with the program hugin and made a 9000 pixel panoramic image which I plan to have printed into a large picture 30 inches wide at 300 dpi. There is a reduced version above - click on the picture to see a 1400-pixel wide panorama. The panorama goes from the western summit tunnel, Tunnel 6 on the right, past Tunnel 7 and 8 and their snowsheds to Donner Lake on the left, eastern side. On the left side you can see past the Truckee area towards Nevada. I took a hike into Tunnel 6 (left upper). This turned out to be a mistake. A pickup truck roared through the tunnel when I was about one-quarter into the tunnel making it necessary to hug the tunnel wall to avoid being run down. Several dirt bikes also roared through the tunnel. I discovered it was a lot healthier to hike over the top of the tunnel. I took a nice shot from up there showing Tunnels 7 and 8 (left lower). I also found a historic plaque on the hill over the top of Tunnel 6 with some interesting facts about the tunnel (left middle). I saw a few trains going over the pass pulled by big modern diesels on the trip. However, what I really wanted to see were some trains going over the top and through the summit tunnels pulled by giant Cab Forwards. Since time machines still aren't available, I'll have to wait until I get my HO scale Donner Pass LDE built to see that!